Attorney Bill Day is just a phone call or an email message away. Call or write today to set up a paid initial consultation to see whether your problem has a legal solution. At your initial consultation, Mr. Day will attentively listen to the unique facts of your personal employment problem and provide you with a candid assessment of what steps you can take. Call now at (301) 762-2675 or send an email from the form below. Please note that any message is not confidential and does not create an attorney-client relationship. Before Mr. Day takes any action on your behalf, you will need to have an initial consultation and enter into a written retainer agreement. Please use clear, detailed, and descriptive subject lines in any encrypted email, including case names if applicable. The computer cannot search the body of encrypted email, so a searchable subject line is essential to finding messages. 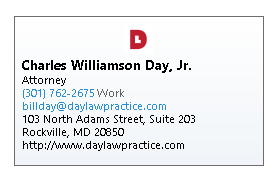 Users who have a digital ID may download the S/MIME Public Key above in order to encrypt email to billday [at] daylawpractice.com. Free Secure Email Certificates are available from Comodo. Microsoft provides instructions on importing keys in Outlook 2007 and Outlook 2013 (People > New Contact > Certificate > Import). The free, open source, and cross platform email client Thunderbird is my choice for security, ease of use and flexibility. Thunderbird can be used with both S/MIME and PGP, as described below. Like Outlook, Thunderbird can import S/MIME keys and sign and encrypt email with them. For law firms, Google and Microsoft have introduced limited S/MIME capabilities for webmail in their enterprise software G Suite and Microsoft Office 365. However, because private keys are hosted on the servers, encryption through webmail does create some security risks. Secure communication is available on the Signal chat app. Number provided upon request. Please note that Signal is not appropriate for any communications that need to be archived or preserved as part of a client or potential client's file. Security is more difficult using email, but it can be backed up and preserved in the file. Parties or potential parties to lawsuits have a duty to preserve all the evidence relevant to their case, including digital evidence. It is a good idea to take precautions to preserve evidence, keep it in a safe place, and provide it to your lawyer when you retain one. Unmarked copies of paper documents, digital files, email, and cell phone data should all be preserved to the best of your ability. Craig Ball has simple instructions for backing up your iPhone. If you belong to an organized group that is interested in learning more about your rights in the workplace or about specific employment law issues such as medical leave or accommodation for disabilities, Mr. Day may be available to give a free presentation to your group. Inquire by phone or email.